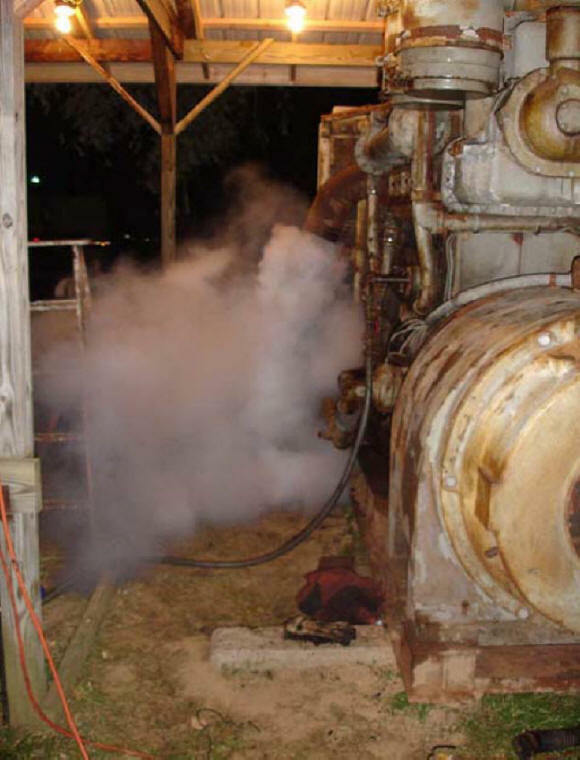 This engine came from a power plant (go here for details of the the original power station) built in the early 1930s to power the offshore Georgia Sapelo island estate of a tobacco magnate. It was used until sometime in the 1960s when commercial power became available. For at least a few years after the coming of commercial power, it was more or less cared for but for about the last 30 years has been allowed to sit idle and deteriorate. The present owners of the power plant decided that the building was needed for another purpose and the generators and auxiliary equipment needed to be removed. 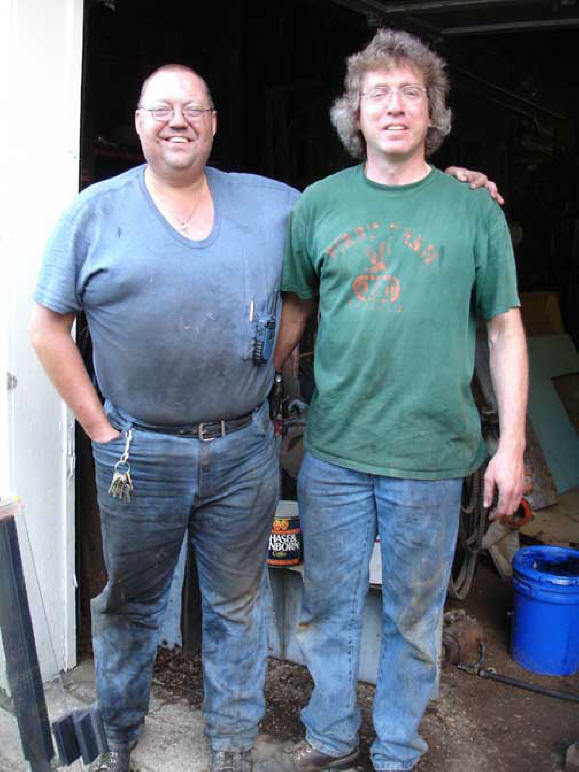 The junk man was considered until Frank Luecke and Elden DuRand discovered it. Frank and Elden went on a search to find new homes for the pieces. 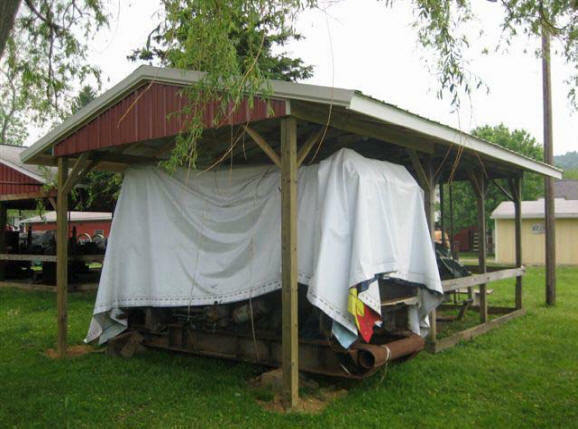 The plan was to donate each of the three generator sets and corresponding auxiliaries to bona fide non-profit organizations where they will be restored and put back into operation. 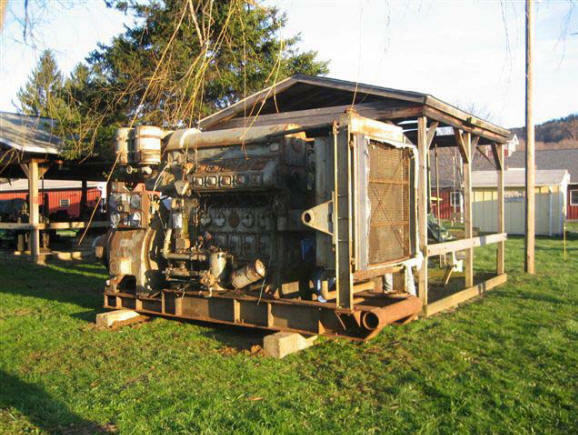 The 300 HP Fairbanks Morse OP, the largest of the three engines, was donated to Coolspring and arrived onsite in April 2007 where it was set in place next to the XVG Pavilion. 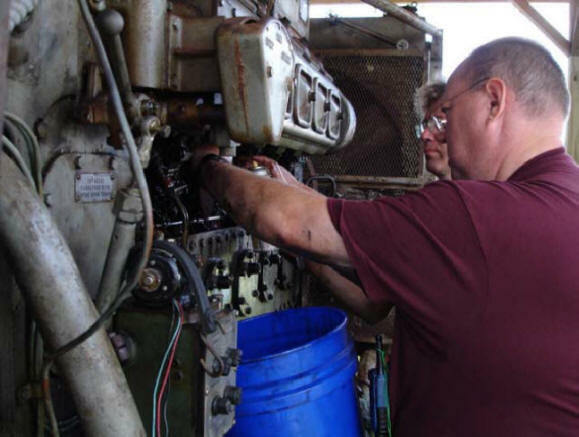 A Coolspring Power Museum volunteer crew began cleaning and working on the OP almost immediately. 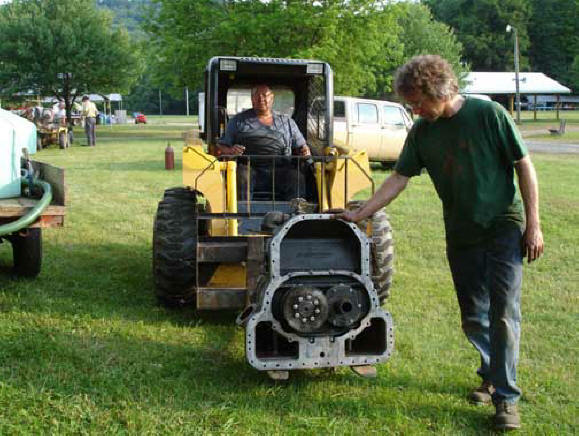 The first attempt to start it was during the June Show in 2007. 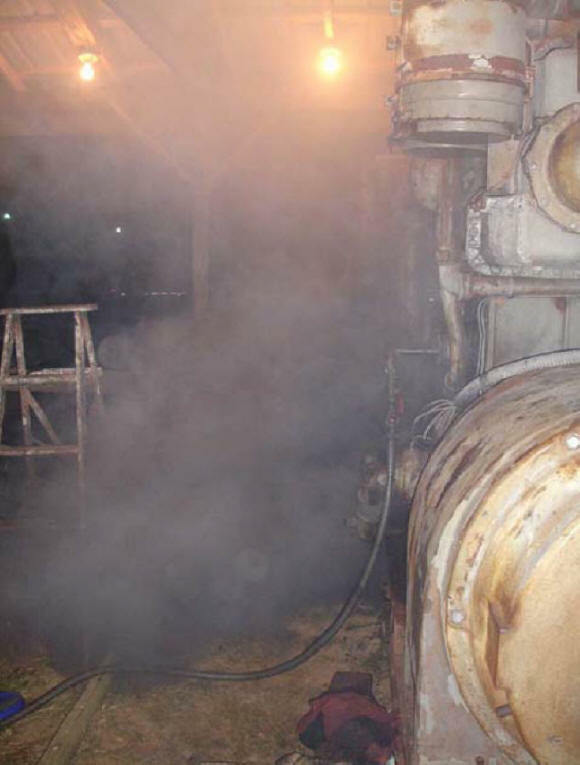 Although we made "Smoke" we couldn't keep the engine running without the starting air. We quickly learned that the scavenging air blower was stuck. 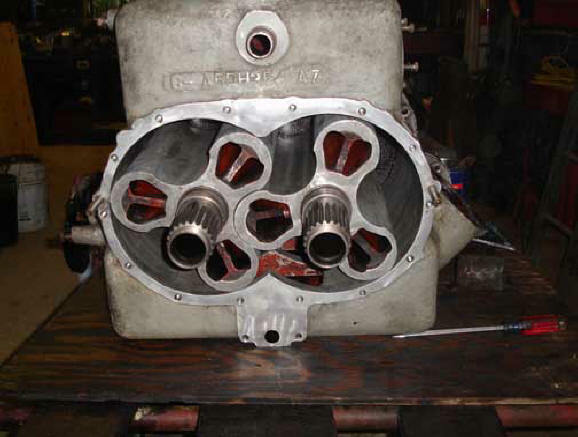 Later in 2007, a volunteer team removed the blower where it waited to be disassembled and cleaned. 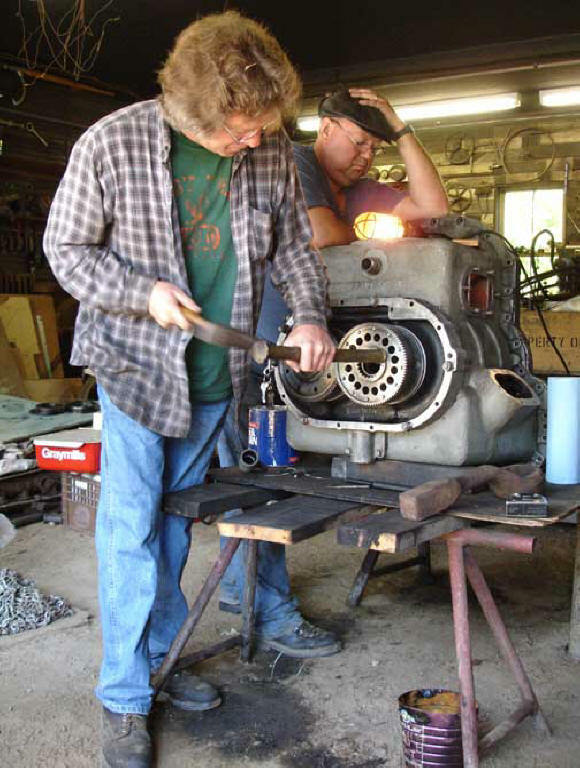 During the June Show in 2008, the blower was completely disassembled and cleaned. Although it was worn from many years of use, it was serviceable. Interesting to note is that whoever assembled this blower last, put it together incorrectly so none of the original factory timing marks were useful. Therefore, it was quite a challenge to get the blower back in time. 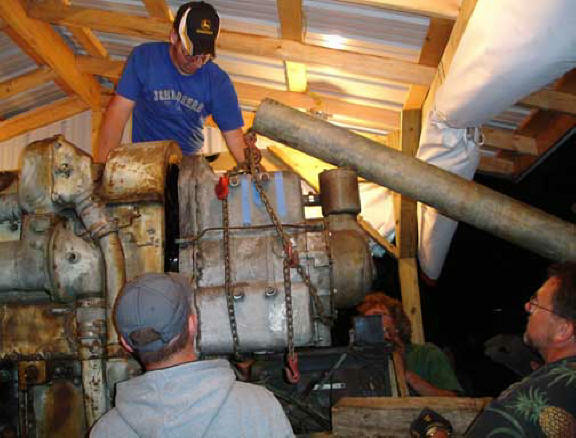 On Saturday, June 21, 2008, we installed the cleaned and now free turning blower. At 11:05 PM, we made our true first smoke. We ran manually at first with the governor disconnected to make sure it wouldn't run away and that everything was OK. Then we shut it down and reconnected the Woodward Governor. A restart quickly raised the engine to full governed speed where it ran quite happily for five or ten minutes until it ran out of fuel. Watch the video of First Smoke after approximately 40 years of idle time. Click Here to watch a video of the third run of the evening at full governed speed. Note these MPG video files are 10+ MB in size and high speed Internet service is required for viewing. Next steps are to rebuild the air intake and filtering system and to establish a fuel tank and system (we had only rigged a temporary tank for testing purposes). 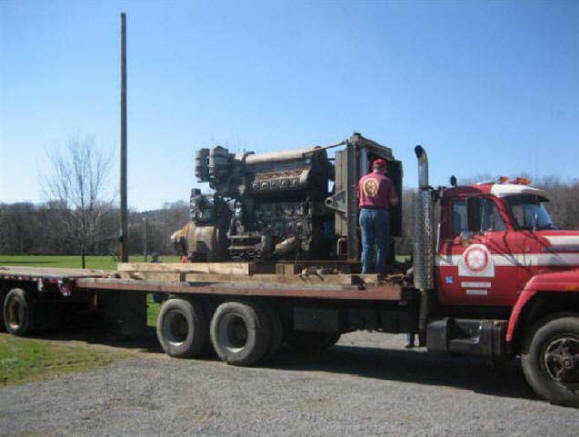 The Fairbanks Morse OP genset was transported by our member, Mark Himes, and was transferred from his trailer to the museum truck. 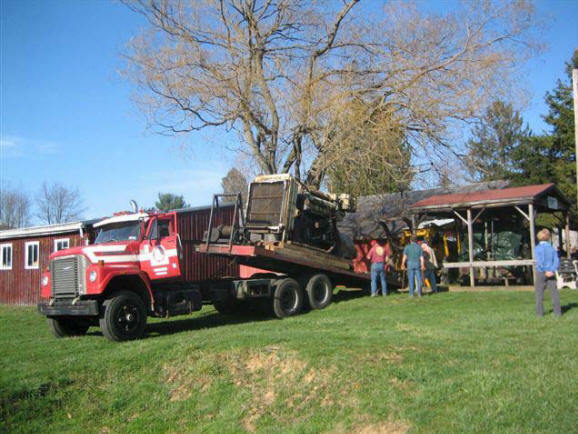 The engine is being unloaded from the "tilt-bed" to its temporary home next to the Ingersoll-Rand XVG pavilion. The engine is in place next to the XVG Pavilion. Volunteers Mike Murphy and Jay Duke clean 40 years worth of gunk out of the engine in preparation for the first start-up attempt. First smoke (sort of) June 2007. Second smoke June 2007, however, it didn't last long. It seems it would only run as long as starting air was supplied. After further investigation, it seems something is wrong with the Roots scavenging blower. Oh well, more to do. Next work weekend we'll have to dissect the blower to see what is wrong. This is the Roots blower that was the cause of the problem. It was found full of rust and aluminum corrosion. Note the very small clearances between the lobes of the two rotors. A 3/4" pile of ferrous rust was sitting between the lobe which bound the rotors from turning. Thus, during the 2007 run attempt, the clutch was slipping on the blower and the engine was not getting any scavenging air. Volunteers Mike Murphy and Jay Duke painstakingly assemble and remove the timing gears in attempt to get the rotors aligned. Unfortunately, the timing marks were wrong on the gears and rotors, so this had to be worked out, THE HARD WAY! Many thanks to Nelson Mangan, Mark Turnbull, and Vance Packard for helping. Jay and Mike transport the clean and ready blower to the engine for installation. It's 10:00 PM, Saturday night, June 21, 2008. The wind is blowing and lightning is quickly approaching. News of strong storms are all around. Yet, the volunteers push on to get this blower installed on the OP. Shown here are Mark Gotschall, his son, and son's friend. I'm glad they showed up. I was exhausted by that time and needed the push. Thanks to Mark for his great rigging idea.